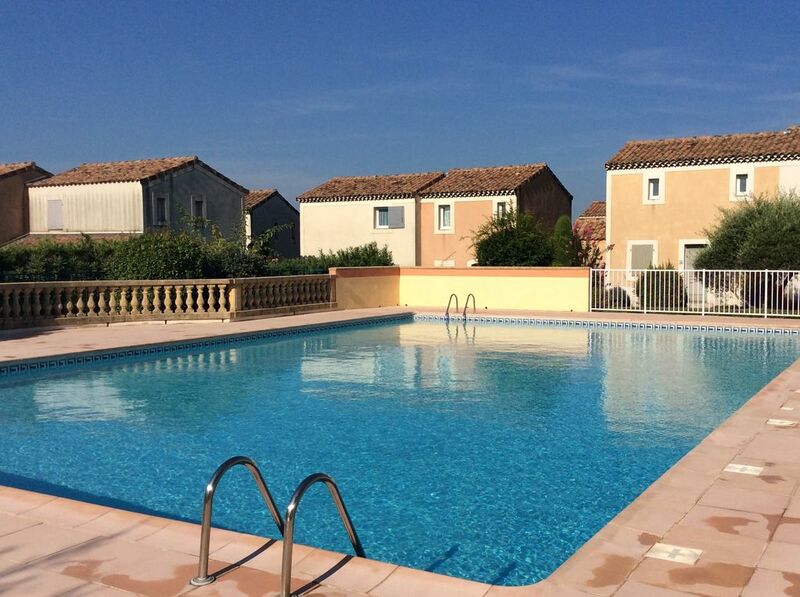 Two bedroom villa in a modern, secure complex with large shared swimming pool. The property features, on the ground floor, a large L-shaped lounge/dining room benefiting from air conditioning with small fully fitted kitchen and separate cloakroom. Doors to patio area with outdoor dining furniture, sun loungers and secure south-west facing small garden. Upstairs the property again has air conditioning and features a double bedroom with door to balcony giving views over the nearby Garrigue hills, a twin bedroom also with large fitted wardrobe and a bathroom with bath and shower over and toilet. La Bastide D'Uzes site is located just a 10 minute walk away from the centre of Uzes with its cafes, restaurants, shops and bustling Saturday markets. The Unesco World Heritage Site of Pont du Gard is only a short drive away where you can enjoy a swim or picnic at the water's edge or hire a canoe and paddle beneath the Roman Aqueduct. The historic centres of Nimes - with its Roman Arena and Avignon with its famous Palais des Papes are both a short drive away. I live in England with my family and we spend most of the year looking forward to spending time in France. We came across the beautiful town of Uzes quite by chance and have never looked back. We love the fabulous weather in the summer and enjoy lounging by the pool some days, wandering in the medieval town centre and exploring the beautiful surrounding area with all the wonderful place to see and visit. We chose La Bastide D'Uzes because of its fantastic location, just a short walk away from the town centre. This means we can take a leisurely stroll to enjoy the shops, cafes, restaurants and fabulous amenities the town has to offer, following by a dip in the pool or perhaps a refreshing pastis and a lively games of boules. Entrance to the site is by coded gates making it feel really safe and secure. The site is also beautifully landscaped with a large communal area and shaded walkways. The large shared swimming pool is a must for the summer and is only a few steps away from the house. Family bathroom with bath and shower over, basin and toilet. Window. The lounge and dining area are air conditioned for when the weather gets really warm, as it often does, with an additional unit upstairs which can keep the bedrooms comfortable for sleeping at night. Wall mounted electrical heaters are throughout the house and the air conditioning units are very effective at getting the whole house. All bedding is provided within the fixed cleaning price of £115 per stay which also includes end of stay washing. A new LG washing machine is located in the landing cupboard and this is available for your use as required. We have a fold up clothes horse for drying washing in the house or garden. Reliable and fast wifi broadband is provided. Bath and tea towels are provided within the fixed price of £115 per stay which also includes end of stay washing. You will need to bring your own towels for use with the swimming pool. L-shaped lounge and dining room with 26" flat screen TV and DVD player, settee and two easy chairs. A wide selection of books, board games and DVDs . Dining table for 6, sideboard and full complement of dining cutlery and crockery. Air con. Situated in the kitchen with washing tablets provided. A new and large fridge freezer has just been installed. Cooker with fan over and four heating rings. A Bosch Tassimo coffee maker is provided ready for you to add your favourite drink pods. There is an initial supply of tea, coffee and sugar and these need to be replaced as used. A full set of china crockery is for your use with the kitchen fully equipped with many utensils and accessories to help you cook your favourite meals. Small fully fitted kitchen with full size dishwasher, oven, large fridge freezer, microwave, Tassimo coffee maker, kettle, toaster and storage cupboards. Includes full range of pots and pans and utensils. We have an expandable dining table that can comfortably seat six people. There is a 26 inch flat screen television fitted to a cantilever wall frame. There is a CD/radio in the main bedroom. A DVD player is linked to the flat screen television. There is also a good selection of films both for children and grown ups. There is an extensive choice of both fiction and non-fiction with French style cook books and loads of information on the beautiful surrounding area. We have a wide selection of games and jigsaws to keep anyone amused. We have a selection of toys, a join together wooden railway and a box of lego bricks. A wide selection of DVDs for both children and grown ups. Our small garden has a hedge surround which makes it very secure for children and private. There is a hardwood patio table and four chairs and steamer type beds for lazing in the sun. Accessed from the main bedroom with views over the nearby Garigue hills. The balcony, as with the garden, is south-west facing and features bistro type table and two chairs. There are numerous kayak hire businesses located on the river Gardon with nearby Colius having a wide selection. From there the amazing Pont du Gard is within easy paddling distance. In the rear garden is a patio area with wooden table and seating for four people with a parasol. There is a ski station on Le Mont Ventoux which is easily accessible from Uzès. There are two clubs in Uzes, one with clay courts, the other with hard courts. Uzes golf course is situated approximately 2 miles away from the property. The fantastic pool, about 20 metres by 15metres, is just down the walkway from our house but pleasingly little noise from the pool can be heard in our enclosed rear garden. A real jewel. Notes on accommodation: Please note this is a non-smoking house and pets are not accepted. A security deposit of £300 (£500 for lets of a month or more) is payable upon with the final rental payment. Outside: The house is situated along a landscaped walkway, shared with other houses a short walk from the communal swimming pool. The pool does not have a shallow 'paddling' end but is fenced with a child-proof gate and is open, weather permitting, from mid-May to the end of September each year. The rear garden is secure and fully enclosed with hedging. Hardwood patio table and chairs for four and sun lounger 'steamers'. BBQ. Utility Room: Washing machine located in cupboard on upstairs landing. Cleaning / Towels / Linen / Maid service: Lettings are subject to an end of stay cleaning charge of £115 which includes the hire and washing of sheets, towels and tea towels, payable with the final balance payment. Note - guests should provide their own swimming towels. Other: Cloakroom in entrance hall. Wifi broadband internet access. Dedicated parking space in the gated site close to the house. We are a family of 4 with two teenage daughters. We wanted a combination of eating in together - with delights bought from the local market and shops - and eating out. We also wanted to do some relaxing pool-time and exploring. Maison 60 met the brief perfectly. We’d give it a 100% rating if possible! The accommodation is great. Two good bedrooms, a good sitting room, a brilliantly equipped kitchen (including, importantly, the basic cleaning materials so that we could keep it as clean and tidy as we found it) and a superb outside area. We spent lots of time out here either eating, using the steamer chairs, playing backgammon or with an aperitif. Top differentiators included the air conditioning units. The facilities and local environment are amazing. The house is situated in a modern development in a traditional style - combining the best of both worlds. We thought the pool without chairs could be a problem, but it proved to be an asset. It enables us to dip at leisure. We spent chunks of time sitting at the side of the pool chatting - with other residents too - and cooling off. Really beautiful. The location is amazing. The beautiful centre of Uzes is only 15 minutes easy walk. It is close enough to walk in for coffee, for the market, for the shops: and close enough to stroll back working off a little of the delicious dinner or extra glass of wine we had because we just couldn’t think of a good reason to leave the Place aux Herbs. The location was a 5 star rating in its own right. Also the location gave us a chance to explore a little. Highlights for us were; Pont du Gard; river swimming in Collias (with great rocks to jump off); Arles; Orange; and the beach at Stes Maries de la mer. We had previously done Avignon and Nimes - and would have happily done them again easily from Maison 60. But the absolute high point was our hosts. Steve and Debbie had thought of everything: their thoughtfulness in the simple things like basic cleaning materials; they offered advice and tops tips on things to do; and helped in every way possible. In fact they made us feel like friends sharing their wonderful home. Thank you both for making us so welcome, and for making our holiday. Many thanks Ben for this great review, which is much appreciated. We have worked hard at making our house as user friendly possible with the recent re-fitting and re-equipping of the kitchen being the latest improvement. So pleased that you had such a great time enjoying yourselves, which for us is so important to ensure and as such I was very happy to give you recommendations for visits and activities in this very beautiful part of France. I hope to welcome you back in the future. Nous sommes restés une semaine dans la petite maison de Steve à Uzès, hors saison au moment des fêtes de fin d'année. La maison est très fonctionnelle avec un salon et la cuisine au rez-de-chaussée et deux chambres et la salle de bain à l'étage. Elle est située dans une résidence très tranquille. L'équipement est de qualité et c'était un vrai plaisir de rentrer le soir après nos escapades. Il manquait peut-être juste un grille-pain et une grande casserole. L'été, la piscine est probablement un plus très appréciable, tout comme la climatisation et le petit jardin dont nous n'avons pas pu profiter. Le centre historique d'Uzès est proche et peut se faire à pied, même si nous avons profité d'être hors saison pour y aller en voiture. Le gros atout de la maison est d'ailleurs son emplacement dans une région magnifique : Uzès et les somptueux petits villages alentours, les gorges du Gardon, le Pont du Gard, il y a vraiment de quoi faire. Nous avons même poussé jusqu'à la grotte de Chauvet Pont d'Arc, à un peu plus d'une heure de route. Pour finir, j'ajouterais que le propriétaire, Steve, répond rapidement par mail aux questions et que nous n'avons pas eu de problème lié au fait qu'il n'y ait personne sur place. Le petit moins : le prix, que je trouve assez élevé (la maison est quand même petite) et qui enlève la cinquième étoile. La majorité de la clientèle de Steve est anglo-saxonne et a probablement un pouvoir d'achat légèrement supérieur à celui des Français (et probablement que cela les rassure de louer à un compatriote qui peut tout leur expliquer dans leur langue). Felicity and Gerald Hudson O.
Uzes is a beautiful and fascinating medieval town. We enjoyed a comfortable, warm stay in this immaculate property. It is easy to walk into the town to explore the restored ancient buildings and streets or to visit the market in the atmospheric Place des Herbes. We were able to park our car in a designated place and feel secure as the site has electric gates. On our arrival the house was fresh and well cleaned; always a good start to a holiday. The house has good facilities and we were impressed with the heating during our autumn/winter stay of 1 month. We have booked to stay again and I would recommend this property highly. Thankyou to the owner, who is professional, helpful and friendly. Firstly - the Uzes area and town - a delightful place with a lot of interesting places and things to do - it kept us busy for a 8 week stay!!! The villa itself has all mod cons and was spotless on our arrival and is very well maintainedl. The back garden is perfectly adequate for a lazy afternoon in the sun (or shade if that is your thing). For the two of us it was amply spacious. The property is set on a secure development and is kept very tidy by the estate maintenance staff. We have to say that swimming is not our thing - so could not comment on the water temperature!! Steve Abbot has been very business-like to deal with. Would we come again? We have already booked a 4 week stay next year!!!! So that must tell you something. Thank you very much for your lovely review. Over your two month stay we have been in fairly frequent contact and I am pleased that you have really enjoyed both our house and Uzès during your stay. I am particularly pleased that you wish to stay again next year and we look forward to welcoming you back. A fantastic place to visit with lots to do for all ages. The villa was brilliant and had everything we needed, the swimming pool is essential at the end of the day! Uzès is perhaps France at its most alluringly authentic. It's a wonderfully maintained medieval town that has plenty of places to eat and shops to browse. But the place still feels like a living town that doesn't solely exist for the sake of the tourist trade. Moreover, it’s an ideal base for exploring some amazing locations. The jaw-dropping Pont du Gard is about a 20-minute drive away, and the towns of Nimes, Avignon, and Arles are all within easy reach. (The road system in the region is excellent). If you're tired of high culture, head to Splashworld waterpark (pricey enough but the kids loved it) or dive off the rocks at Cascades du Sautadet. The location of the Bastide complex cannot be faulted--just a leisurely 10-15 minute walk to the heart of the town. The facilities are kept in tip-top condition. The pool is warm and although it is a shared with others we never found it crowded in July. There's even a nice gravel-covered open area nearby if you want to go full-on native and play boules (provided in the villa). The villa itself was ideal for us (two adults and two children). The two bedrooms have sufficient storage, with the main bedroom even featuring a small balcony. Air conditioning, Wi-Fi, and dishwasher/washing machine are welcome creature comforts. But what we enjoyed above all was the pocket garden out back—ideal for cooking with the charcoal barbecue or simply chilling out. Finally, the owner Steve was very considerate and I got the impression he really wants his visitors to enjoy their stay. We certainly did! Many thanks for this great review and I am so pleased that you enjoyed your stay at our house in beautiful Uzès. The rear garden is surrounded by hedges so both private and protected but at the same time a wonderful sun trap, facing south west. We always love spending time just relaxing there on the sun beds or taking lunch or dinner. I certainly do want all of our guests to fully enjoy their holiday and I am glad you felt that was the case. 20 minutes drive from Nimes airport. 1 hour drive from Montpellier airport. 40 minutes drive from Avignon airport and TGV station. There are many restaurants/cafes in Uzes town centre along with art galleries, fashion stores and antique and brocante shops. The central Place aux Herbes hosts the weekly Wednesday local produce market and the much larger Saturday market that extends to the local boulevards. The town centre also includes banks, boulangeries and small supermarkets with larger supermarkets and DIY stores located on the outskirts of the town. The surrounding area boasts many local vineyards with degustations and further afield the Roman towns of Arles, Orange, St Remy de Provence offer Roman remains and museums. The cities of Nimes, Montpellier and Avignon also boast a large array of sites for visitors. Heading towards the coast the medieval fortress town of Aigues-Mortes, the fishing port of Stes Maries-de-la-Mer and the Camargue nature reserve, home to numerous species of birds, the famous white horses and flamingoes making the area well worth a visit. Booking Notes: The completion of a rental agreement is required. A non-refundable deposit of 25% of the total rental is payable at the time of booking, with a minimum of £150. The balance is due 8 weeks before the rental starts. If the booking is made within 8 weeks of arrival the full balance is payable immediately. A £300 security deposit is required, or £500 for rentals of a month or more, and should be paid with your final balance. Providing the property is left in a satisfactory condition this will be refunded less any breakages following confirmation from our caretaker and the cost of electricity used on low season rentals between the end of September and mid May. Changeover Day: Changeover day is Saturday although this can be flexible in the low season. Arrival after 4pm, departure by 10am please. Notes on prices: A fair usage allowance of €25 per week for electricity is included within the booking prices for the weeks from mid May to the end of September. Electricity for longer out of season lets is charged according to actual usage by meter readings.